If it looks like it, it’ll save it! Did you know that not only do some of the food that we consume look a lot like our own body parts and organs, it’s great for their health too? Don’t believe me? Check out some of these bizarre similarities and how your body can benefit from them. A team of researchers from the US National Cancer Institute discovered that a weekly serving of broccoli could reduce prostate cancer risk by 45%! 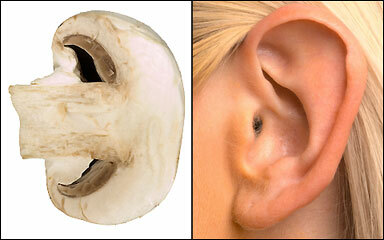 Eating mushrooms can help improve your hearing. Mushrooms contain Vitamin D, which is important for the growth of healthy bones, including those we have in our ears that transmit sounds to the brain. The yellow-coloured fruit may be just the thing to brighten up your day! It contains a protein which converts into serotonin upon digestion. Increased levels of serotonin, also known as a “happy feeling” chemical, has been linked to happier moods. Did you know that one of ginger’s biggest health benefits is to aid in digestion? It is a popular remedy for motion sickness and has been used for over 2,000 years by the Chinese to calm the stomach and to cure nausea. 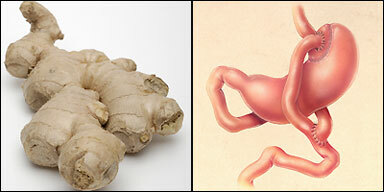 Also studies done on rats by the University of Minnesota found that ginger hindered the growth of bowel tumours.